There’s a lot of fishing pressure in Upstate New York. 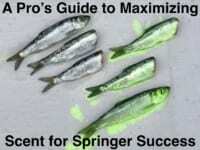 And, because of the increased number of anglers capitalizing on the egg bite curing your eggs properly is imperative. A properly cured egg will make or break your fishing trip. 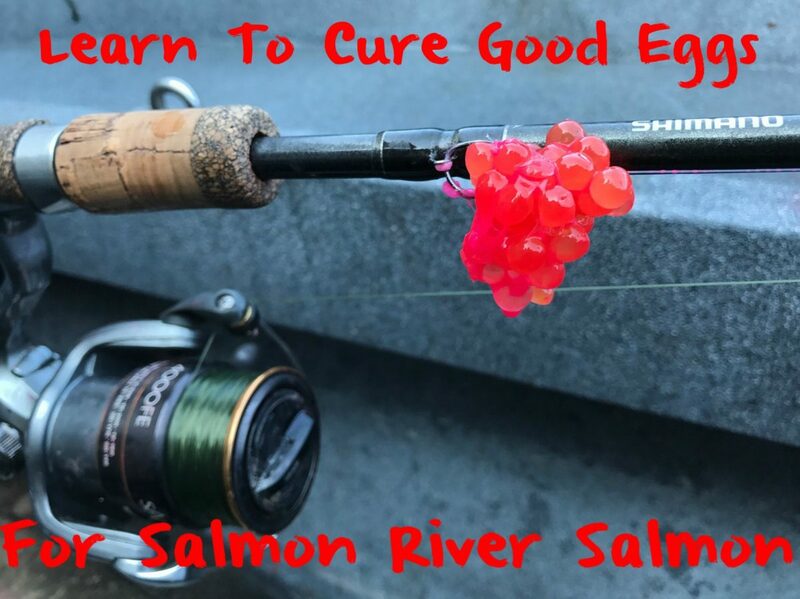 Repeatedly, while in my drift boat, I’ve seen guys on the bank with poorly cured eggs not having success, whereas those arriving with well-cured eggs catch salmon more frequently. Achieving good, cured eggs is easier than you think. Here’s what I do and it’s something a beginner can do, too. We all know to finish with a good egg you need to start with a good egg, which means all fish must be bled the moment you catch it. You don’t want any blood in the eggs. Butterfly skeins. Then place the skeins in a Tupperware or Ziploc. 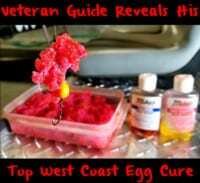 I’ve been using a lot of Pink Fire Cure this fall, even though many Great Lakes anglers opt for Natural and Orange Fire Cure. Pink has been the hot color on the Salmon and Oswego this fall. Once I coat the skein, I’ll put on my gloves and massage the egg to ensure that the cure gets in all the folds. It’s important to get the cure into inch of the skein. I’ll let them sit for three to five hours at room temperature. At this point they’ll juice out. That’s ok. Don’t get worried. They are going to juice out and your eggs will eventually shrink and become hard. That’s what you want. Now it’s time to let them sit in the fridge. I’ll let them sit in the fridge for at least at day, but preferably three to five days. Once you do this step the eggs will plump back up (or re-inflate) and then they are ready to fish. It’s important to let the eggs cure for an absolute minimum of 24 hours. However, results will improve drastically if you let them sit longer. Remove the eggs from the containers and individually bag the skeins. When I go out for the day I’ll grab a bag at a time. Once my eggs go out of the fridge they never go back. So, I make a smaller bag so I don’t spoil or waste eggs. I don’t want to take out four skeins and not use them all. Editor’s Note: Andy Bliss operates Chasin Tail Adventures. For more info on his Salmon & Oswego River guided salmon trips please visit http://www.chasintailadventures.com or https://www.facebook.com/chasintailadv.